There’s a new website for those who love that super-popular Gotye song we just made fun of, but think its one big problem is that it’s only about four minutes long. Earlier this month, MIT hosted a Music Hack Day, billed as an event “where programmers, designers and artists come together to conceptualize, build and demo the future of music.” One of the projects to emerge was Paul Lamere’s Infinite Jukebox, an online app for Chrome and Safari that breaks down any uploaded song into individual beats, finds matches between those beats, and creates a series of pathways through the song. These pathways can then be used to create an “infinite” version that jumps back and forth between matching beats. It works better with some tracks than others: Carly Rae Jepsen’s “Call Me Maybe” mostly just crosses back and forth between choruses, while the ’60s Batman theme tends to get stuck in an infinite “Batman! Batman! Batman!” chorus. And some kind soul uploaded Limahl’s theme song to the movie Neverending Story, which sounds stuttery as it leaps between verses without regard to the lyrics. Still, the Infinite Jukebox has a lot of depth as an online toy—users can try out songs other people have uploaded (warning: other people make terrible choices, from grating, unnecessary earworms to deliberate jokes), and the most uploaded songs list makes for curious reading and exploring. The visualizer, which tracks the paths and lets users jump between points of a song at will, is mighty neat, just for the way it maps a song; it’s worth uploading things solely to see what kind of patterns the music’s repetitions create. 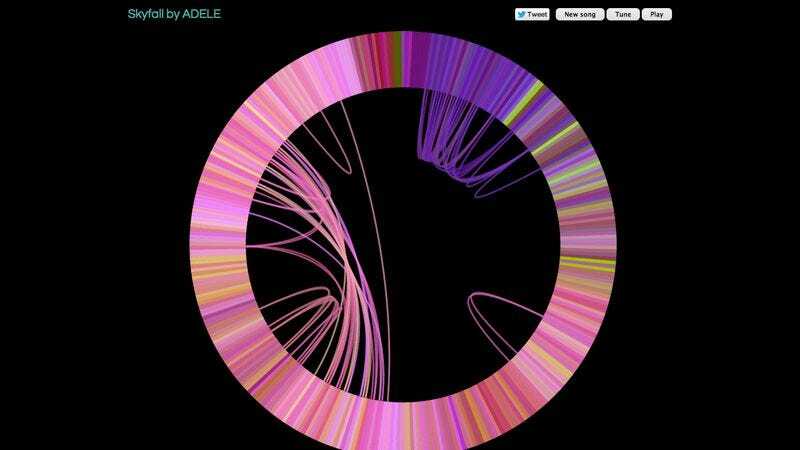 And once the novelty of hours of Adele starts to pale, try playing around with the “tune” button, which lets users choose and reset the standards for branches to complicate or simplify the song. Similarly, the controls found in the FAQ make it possible to speed up or slow down play by skipping from beat to beat. For a weekend’s work, this is an impressively sophisticated toy, one that makes it almost-kinda possible for us to go live in those song-homes we talked about back in July.